In today’s generation, a lot of young people are looking for ways to travel the world. They say that traveling can help reduce your stress, anxiety, and help you live freely. Yet, what can you do if you’re caught in a situation wherein you either reduce your baggage weight or pay a large amount of money just to pass the check-in counter at an airline? In this article, we answer the most common question asked by beginners, “where can I weigh my luggage?”. All airline companies have luggage weight restrictions, but not all of them are the same. In an economy class, the average charges of an airline for overweight luggage are between $60 to $150 for a bag that weighs between 51 to 70 pounds, and around $100 to $175 for a bag that weighs between 70 to 100 pounds. This can be a hefty price to pay especially if you’re a traveler who’s tight on their budget. Most airlines do not have weight requirements on the carry-on luggage, but they can be strict on the actual size of your bag. The general rule is that the carry-on luggage must be able to fit the overhead compartment. An airline usually has a crate wherein you can check if your bag fits or not. Some airlines, however, have weight restrictions on carry-on luggage. Delta and American Airlines only allow a carry-on to be around 40 pounds and Air France will only allow you to have a bag that weighs 26.4 pounds. Weight requirements for check-in luggage can be confusing at times because airlines have their different limits. Budget airlines will usually only allow a bag not to exceed 40 pounds, an economy class ticket will only give you an allowance of 50 pounds, and a premium ticket will only give you up to 70 pounds. To ensure that you don’t exceed your weight limit, always check the site of the airline and read their weight restrictions. If you’re using different airlines for your connected flights, check both airline sites accordingly to avoid paying for the extra pounds. Where Can I Weigh My Luggage? Using a bathroom scale to check the weight of your luggage may not give you an accurate number, but it will give you an estimate. To do this, weigh yourself on the scale. Then, pick up your luggage and check your weight again. After that, subtract your initial weight without your bag from your weight when you were carrying your bag. The result will give you an estimate of how much your bag weighs. 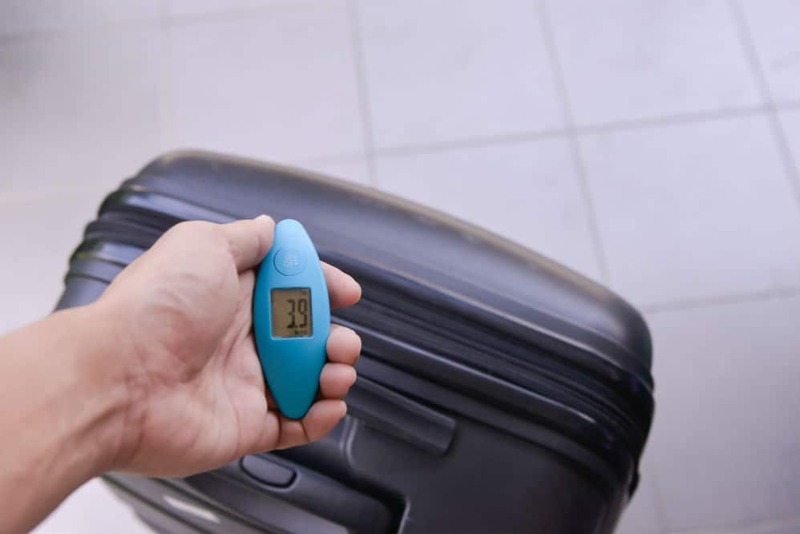 A lot of travelers bring with them a luggage scale to ensure that they don’t exceed their weight limit at both ends of their travel. These scales are usually lightweight, portable, and accurate. You simply hook the scale on your bag handle, lift the scale, and it will show you the weight. If you’re not fond of constantly weighing your luggage, then a built-in scale on your suitcase can be your best friend during your travel. You will usually find the scale on the handle, and it can be very accurate. Most airports have their own scale to weigh in your luggage. If you have an ample amount of time left before your flight leaves, you can use these scales to check if you’re within your weight limit. Be wary, though. A lot of airport scales are not accurate and can often show an overweight bag. Most of your clothes won’t smell fresh when you reach your destination because it has been sitting in your luggage for long hours. To keep the fresh smell on your clothes, put a standard tumble dryer sheet with your clothes. Laptops or iPads can be quite troublesome to travel with, especially if you’re putting it in a bag. Try covering your laptop with a bubble wrap to protect it from breaking. Not only is this alternative lightweight compared to a laptop bag, but people are less likely to steal something that’s wrapped with plastic. Airlines can also be strict when it comes to carrying any liquid in the place. Most of the time, you can only bring not more than 100 ml of bottled liquid. Seasoned travelers would usually bring a big empty bottle of water at the check-in counters and just refill it at a drinking tap. A lot of people tend to carry more cash when they’re traveling, and this makes you prone to robbery. To avoid this on your next travel, you can try and make a decoy wallet. Hide your wallet or money somewhere safe inside your carry-on luggage and buy a decoy wallet and put it inside your pocket. Don’t forget to bring with you your change so that you won’t have to get your money constantly. If you’re one of those people who is constantly forgetting where they last put their phones, then this might be the best tip for you. Try taking constant selfies anywhere you go and store it somewhere on your phone that only you may know. If your phone gets lost and is handed to the officials, you can easily prove to everyone that you own the phone by showing your pictures. Traveling is one of the best ways to reduce one’s stress. If you’re planning to travel by air, always remember to check the restrictions of the airline that you chose. By checking your luggage limit before you go to the airport, you can now avoid asking yourself the question of where can you weigh your luggage. Also, make sure to travel smart by using some of the tips we mentioned above.